by pfornof on May 8, 2018 . Everett Yang is a freshman studying computer science. They want to pursue a career in video game design — blending art and technology. That’s why they were inspired when they visited the Museum of the Moving Image in Queens. The Museum of the Moving Image works to foster an understanding and appreciation of the melding of technology and media. Everett visited and was dazzled by the museum’s display on Jim Henson — the famous filmmaker and puppeteer, most well known for his creation of The Muppets. Going to this exhibit inspired Everett to create a puppet of their own. They found iCREATE through their ITS 101 Introduction to Stony Brook class, and they were interested in the resources iCREATE has to offer. 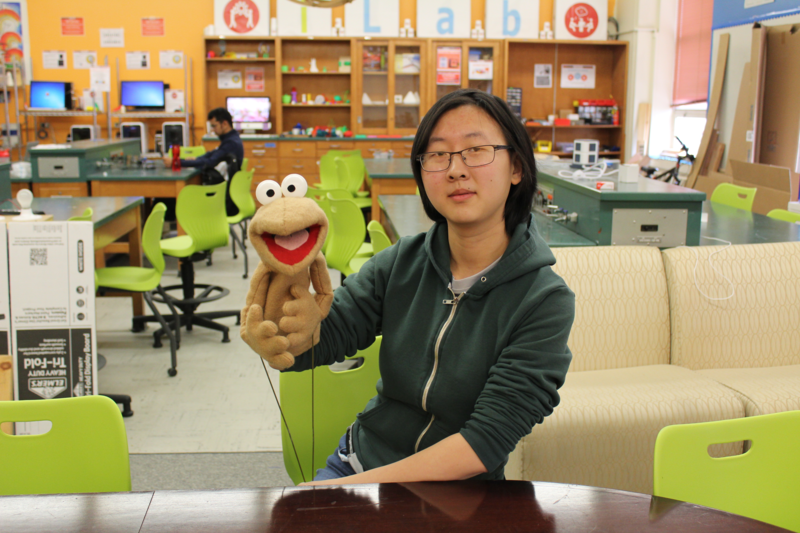 Once they decided to create their own puppet, going to the Innovation Lab seemed like the clear choice to make that idea into a reality. 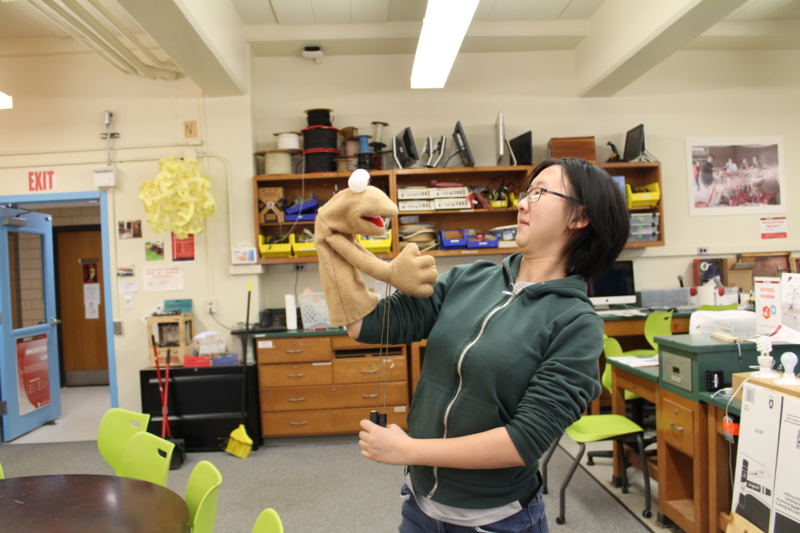 They found a pattern and materials online and used the resources in the Innovation Lab to bring the puppet to life. The eyes are made of ping pong balls, and Everett used wire cutters to cut up metal hangers for the rods that control the puppets arms. Everett then attached the rods to cardboard bases in the hands, and used the sewing machine to sew it together. Puppetry is a very ancient art form dating back to as early as Egypt in 2000 BCE with some historians hypothesizing that puppets pre-date actors in theater. However, the modern rise in popularity of puppets in the United States originated in the 1940’s with the advent of television. Shows such as Howdy Doody and the Charlie McCarthy Show appealed to both children and adults. 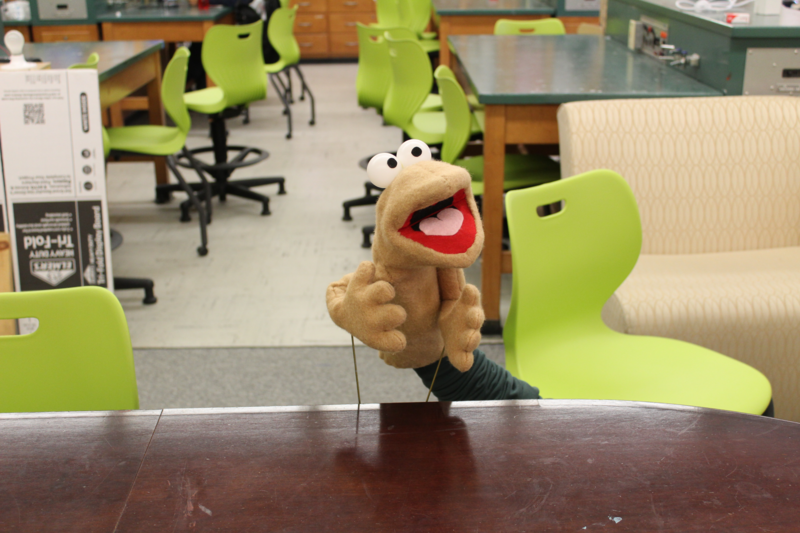 Everett wants to do more adult-geared comedy with his puppet, but wants to start off small, such as creating lip-syncing videos or sketches from The Muppets. If they do this, Everett will be sure to use the multimedia tools offered in the Innovation Greenhouse to create a YouTube channel. 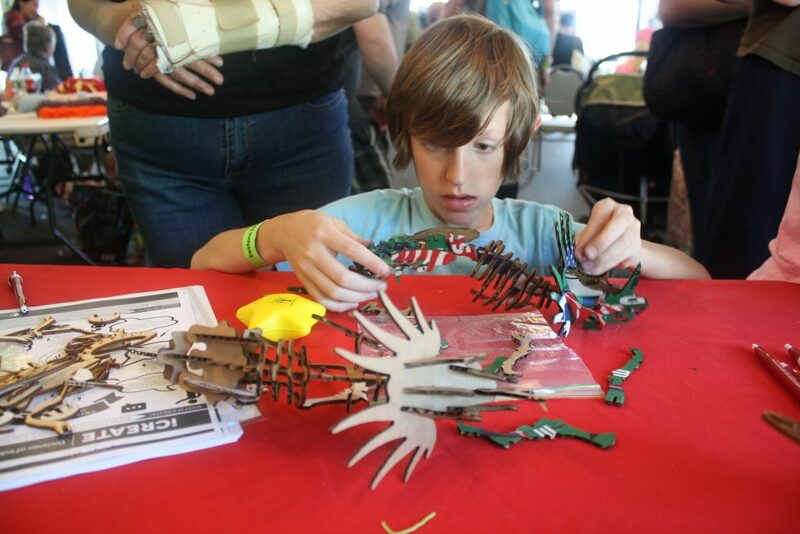 Taking influences from ancient puppetry as well as modern, “The puppet doesn’t have a name or species,” according to Everett, “It’s up to interpretation.” Everett’s next step will be to create a puppet with legs. Brian Yang is a senior with a double major in Biology and Economics and a minor in Chemistry. If that’s not enough, Brian also has recently taken up additional innovation projects — the biggest of which is building his own 3D printer. Brian received a commercial 3D printer as a gift. Something in Brian was sparked, and a new passion was ignited. 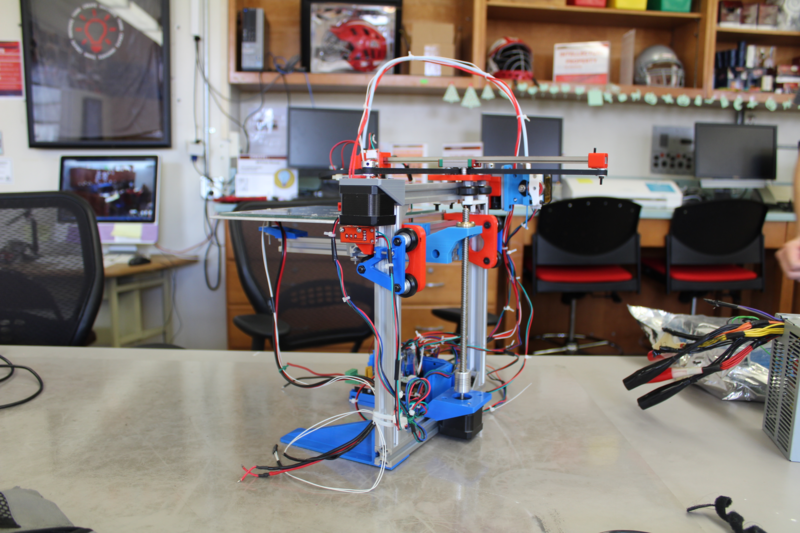 Brian began to learn more about 3D printers and the technology behind them, and was eventually inspired to create his own by the RepRap Project. The RepRap project — short for Replicating Rapid-prototyper — is an initiative to create low-cost 3D printers that can 3D print most of their own parts (You read that right. 3D printers are being made to 3D print more 3D printers.). It is now a global project with free designs and licenses for anyone to use. When Brian realized that this was something he wanted to do, he knew that the Innovation Lab was the place to go. 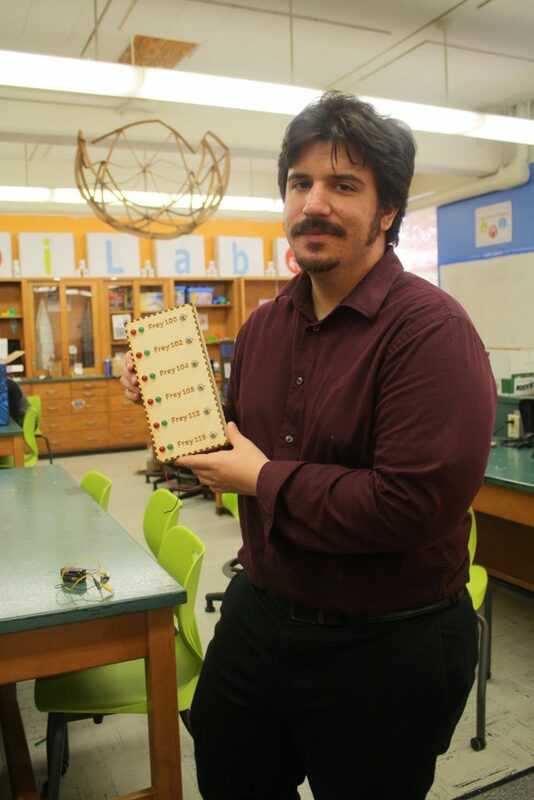 He designed all of the 3D printed parts of the robot himself using Autodesk Inventor, and went to the Innovation Lab to physically print as well as utilize other tools such as soldering irons, screwdrivers, pliers, and general help from the Innovation Consultants on how to execute the project and make sure it was unique. Brian wanted to make his printer different than others already out there. He thought he could maybe do better. His printer is a parallel robot instead of the typical serial robots on the market. By using a different layout, he was able to both reduce the amount of frame and open up the print surface. The pros of these modifications are decreased costs and increased visualization. The disadvantage to this layout, Brian found, is that because the gantry is cantilevered, it is less stiff and can bend under the weight of the printer head. 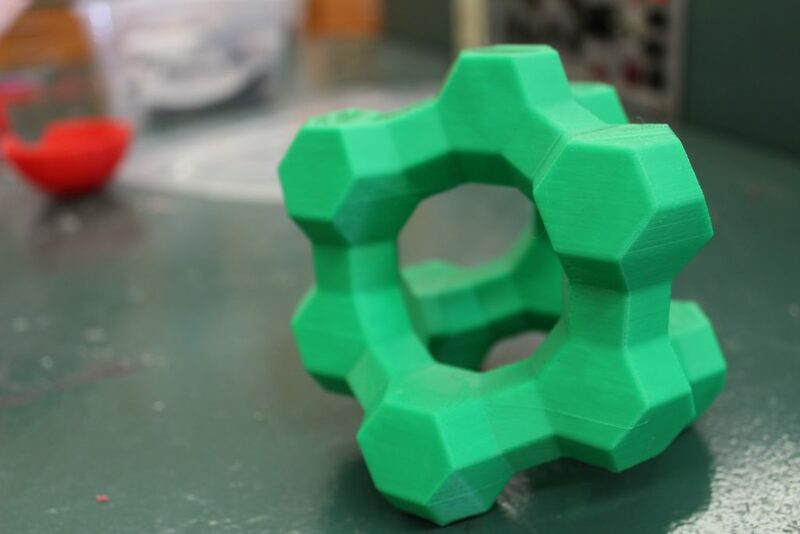 Brian hopes that experimenting with other designs will help others to think more innovatively when it comes to designing new types of 3D printers, and he hopes that his design will help to inspire others. WolfieTank is a pitch competition similar to the NBC hit show Shark Tank. It is iCREATE’s annual showcase event in the Fall semester and simulates a business environment where budding entrepreneurs can have a platform to present their idea and receive critical feedback from professionals in the industry. Benjamin packages his own dark chocolate at his company, Five North Chocolate, because he thinks farmers get lost in the supply chain and does not profit as much as everyone else in the industry. He is working hard to make fair trade dark chocolate more widely accessible in today’s market, to protect the future of the cocoa industry. Yehonathan created MAPLE system for robots giving them the ability to localize themselves in any new space and can be customized to a user’s intended projects. Stepping up accuracy and fast positioning measurements are key for higher level functions in robots, so one day, they can possibly think just like humans. This group formed in order to promote a more non invasive method for assessing systolic and diastolic blood pressure. They invented a novel blood pressure cuff that is fully integratable with current pressure measurement technology (both digital and manual.) This would remove the need for Velcro components and is truly a one size fits all model. Outland Analytics is developing a sensor detection system to monitor land for illegal vehicle use and timber theft. This product will monitor large areas of land for illegal vehicle use and timber theft, providing immediate notifications, thus allowing law enforcement and or security forces to respond instantly. This group created a multi-functional toilet, incorporating a power generator that converts the kinetic energy of water into electrical energy. The product uses a water motion active transducer (WMAT) based on a dielectric elastomer, which, when in contact with moving water, creates a potential difference that can be used to induce an electric current that can power electric appliances. Wolfie Tank featured three judges: James Keane, Youn Jung Chung, and Jonathan Bernard. James Keane is a 2008 graduate of Stony Brook’s MBA program and currently serves as the Global Director of Disruptive Growth Exploration at the world’s largest global brewer, Anheuser-Busch InBev, responsible for investigating, testing, and commercializing new technology and business models with the capability of disrupting ABI. Youn Jung Chung is the Founder of Dal Enterprises, an Amazon consulting services company. A Stony Brook University Class of 2015 graduate, she began her company shortly after graduation with $1500 and bootstrapped it to over 6 figures. She is a graduate of The Founder Institute, the world’s premier idea-stage accelerator, and a brother of Alpha Kappa Psi, the professional co-ed business fraternity. Youn loves giving back by hiring and mentoring Stony Brook students and connecting them with the larger startup ecosystem. Jonathan Bernard graduated Stony Brook University in 2015 and started working in accounting. After a couple years of internship/real world experience, he realized he wanted to follow his personal passions of cooking and growing food. Around that very same time, an urban farming accelerator had started called Square Roots, allowing him to spend a full year growing food and starting his own business in real time. Fast forward one year later, and he is now launching his very own startup called Street Leafs, which turns space into food, community, and an experience. Wolfie Tank also featured multiple raffles and was a great space for students, staff, and other innovators to network, communicate, and collaborate. InnovateIT 2018, a first-of-its-kind, on-campus, multidisciplinary event on March 2nd, brought together over 100 students, mentors, and volunteers at the iCREATE facilities to offer solutions to resolve a major global conflict. Participants working in teams developed ideas from creating inventive ways to help with food pantries, recycling food products, prosthetics for children in need, food disposal, and much more. This cutting-edge event was an iCREATE | Division of Information Technology showcase where students from around campus were encouraged to explore and utilize innovative tools and techniques in developing their own original ideas. Despite an unexpected Nor’easter sweeping in on Friday, March 2nd and potentially bringing the event to a screeching halt, the organizers felt that it was imperative to offer an on-campus event for their dedicated participants. The concept behind InnovateIT was conceived many months ago when a driven group of students from iCREATE decided to work collaboratively with the Director. Their mission: To put on a event that would be different from the standard, traditional hack-a-thon. Hack-a-thons are traditionally geared towards computer science programmers or engineers developing apps and / or connected products to solve a common issue or problem. These usually drastically limit the interest and participation from other on-campus majors. One of the core elements and missions of iCREATE is to overcome this barrier of entry, and focus on offering interdisciplinary innovation across the campus so that all can participate and collaborate, regardless of their major. At the InnovateIT 2018 opening ceremony, Director David Ecker discussed his childhood experience growing up in a house where his mother hand-made his Halloween costumes each year on a sewing machine. As a student, he was interested in the food pantry on campus and had visited them twice to find out more about them. He shared the need to get out the word of this resource, and addressed the existing problem on how to make students feel more comfortable about going to the food pantry. From his experience, “It is a very humbling to go to such a place [like a food pantry], when you don’t have enough money. It is very personal and hard to admit a problem.” He understood, and admitted how embarrassed he would be. This powerful opening rallied students to think creatively about their concerns, and how to conquer them. At the event, there were many student teams looking to offer solutions with the stigma surrounding food pantries as a resource, as well as other social and world issues. After working all night, energized teams proudly presented their work at 8am the next morning. One group was determined to develop their idea – working on an app to let users know when there was extra food from events on campus. Another team was working on a app to track social conscious companies. Kelvin Rodriguez, a freshman participating at InnovateIT, found the event to be life-changing for his career. Passionate about his childhood dream in working with prosthetics, Kelvin seized the opportunity iCREATE offered to construct his very first prosthetic. InnovateIT’s impact was felt by many through its staff and its mission to its participants. by tihhuang on November 21, 2017 . Marvin, an MBA student and Photography club president, experimented with custom bokeh shapes in his photography using the vinyl cutter. Despite having the background of an electrical engineer (Bachelor’s Degree), Marvin always had an interest and passion for photography. His photography is something he want to experiment with, to further develop his personal style. The bokeh style comes from the Japanese word boke (ボケ), which means “blur” or “haze”, or boke-aji, the “blur quality”, as defined by Nikon. In short, it is a style that captures the primary subject in focus (clearest), but the rest behind it is blurred. 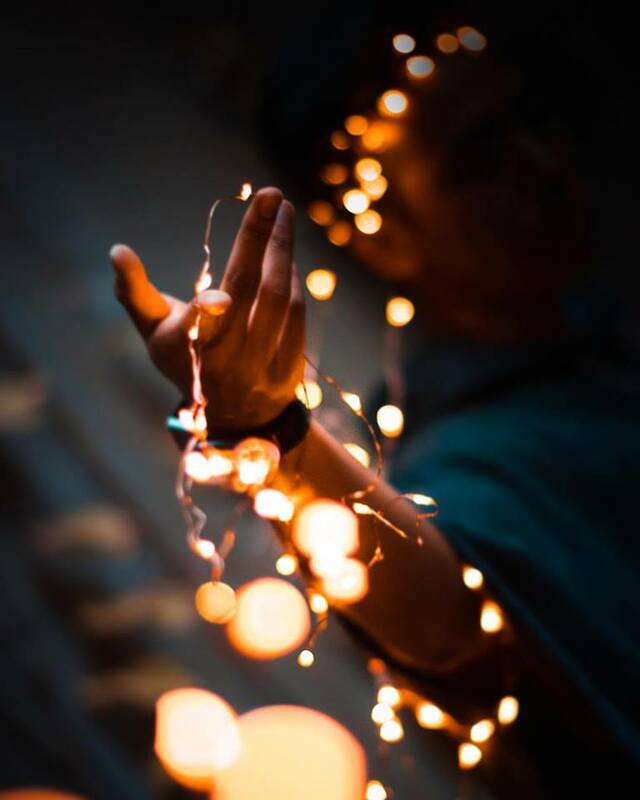 There are points of light that are affected by the bokeh filter – they become softer orb shapes and are captured in the customized shape of the bokeh filter. 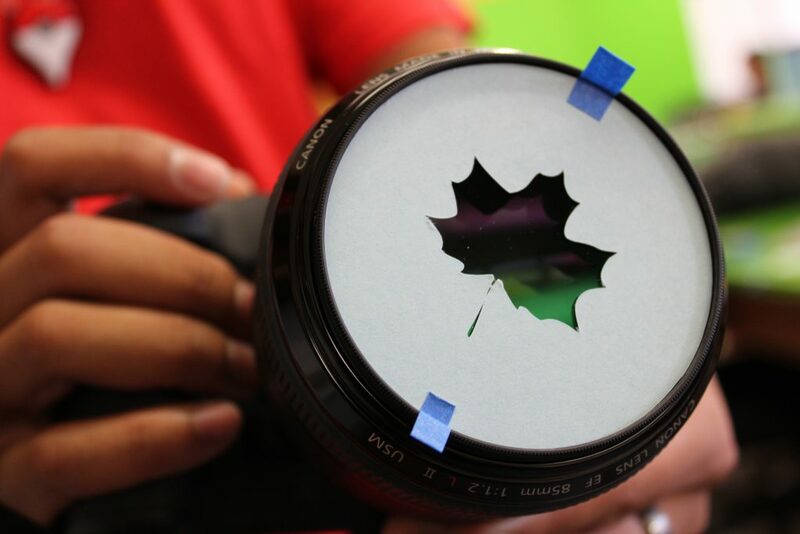 To make the filters, Marvin finds a shape that he outlines on the Cameo Silhouette (vinyl cutter) software, and fits to the size of his lens. The bokeh filter works by covering the front of the lens of the camera. It (ideally) fits perfectly over the lens, and can be held in place with a very small piece of tape. Above: The copper string lights that Marvin uses in his pictures, shown here without the bokeh filter on. 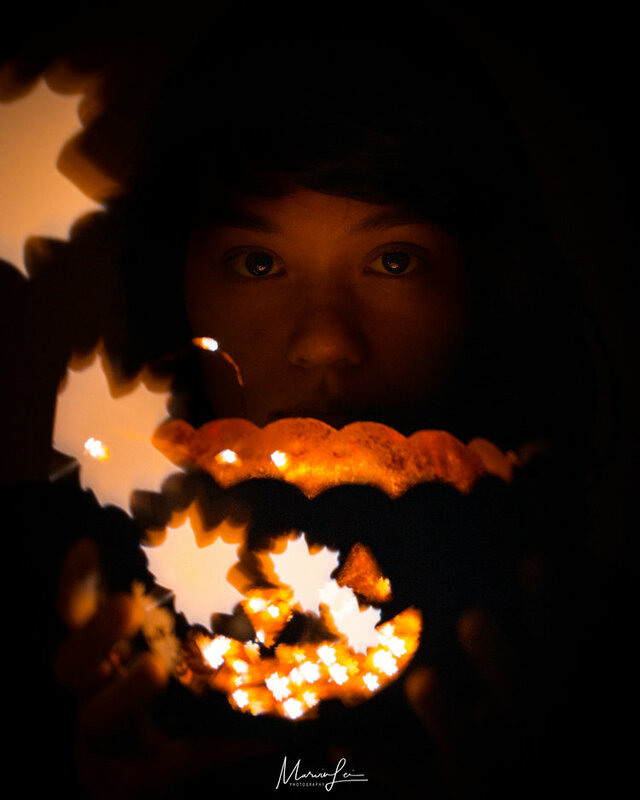 In his pictures, Marvin uses copper wire string lights, attached to a battery for portability, to achieve the effect. Each light, when rendered, appears as the blurred light in the desired shape. Above: Shot in Starbucks on campus, with the copper string lights and leaf shaped filter. One of Marvin’s first experiences with photography was at his first job in a jewelry store. He would take pictures of the inventory and upload it to the database; on occasion, the pictures were used for advertising. A Stony Brook University undergraduate of the 2015 class, Marvin had decided to work for two years before returning this year for his MBA. In that time, he worked in networking engineering for a company in Hauppauge, where he’s from. He continued doing photo shoots of friends, and friends of their friends casually during this time, and it was at this job where he began getting recognized for the quality of his work and photos, and he started receiving offers to be paid for his services. After working at his job, he came back to Stony Brook University to pursue an MBA to further develop his soft skills – like those in communication and management. Marvin says that he prefers to have his electrical engineering background as a back-end part of what he does. It was at his MBA program’s orientation that he heard David Ecker, the Director of iCREATE, speak about the free spaces and technologies offered and available on campus. Above: A portrait shot with the leaf bokeh filter. 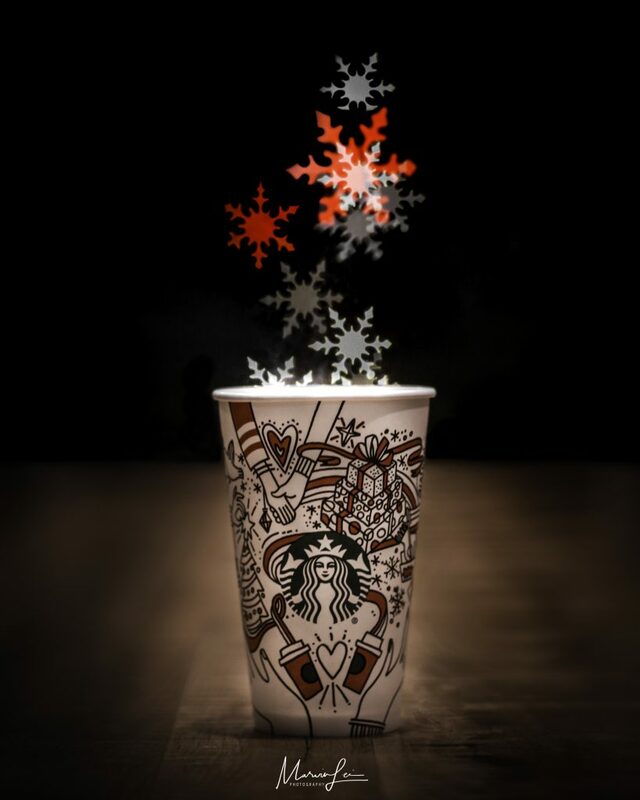 Above: Shot with a snowflake shaped bokeh filter. So far, Marvin has worked with some styles including steel wool and milky way shots, but his favorite is portrait photography. 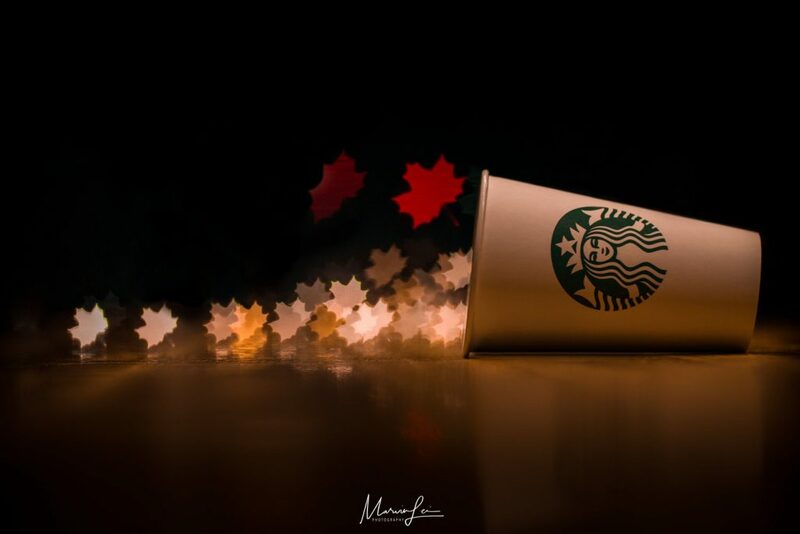 He has been experimenting with incorporating bokeh shapes into his portraits. His website can be seen here. by tihhuang on October 24, 2017 . 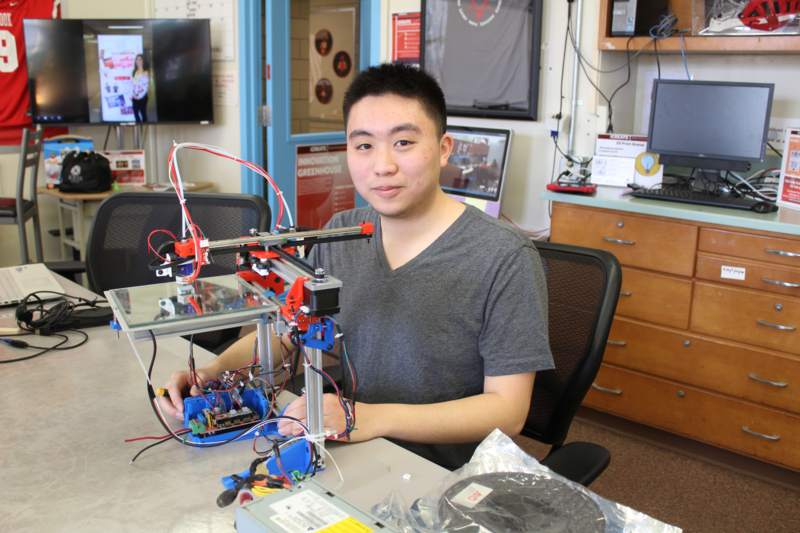 Jackie Zheng is a sophomore Chemistry major who discovered the Innovation Lab at the end of his freshman year. 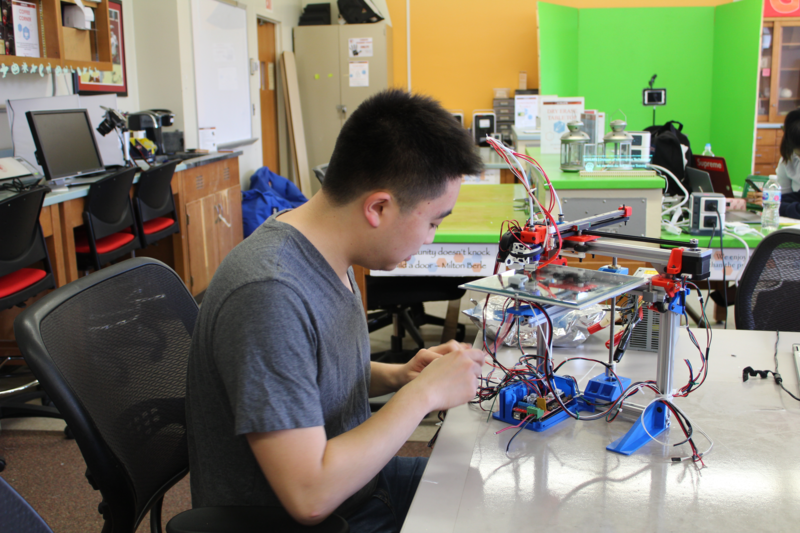 Since then, he’s been involved in the 3D modeling and printing in the Innovation Lab’s Self Service and print queue, which employs a number of UP Mini 2’s, Taz’s, and Ultimakers. As the event coordinator for ACS (American Chemistry Society), a club of about 20-30 members, Jackie handles a portion of the community outreach that has events with elementary school children that teaches and demonstrates different chemical reactions and explanations. While Jackie had learned from modeling in high school, he’s trying to learn more through exploring his options. 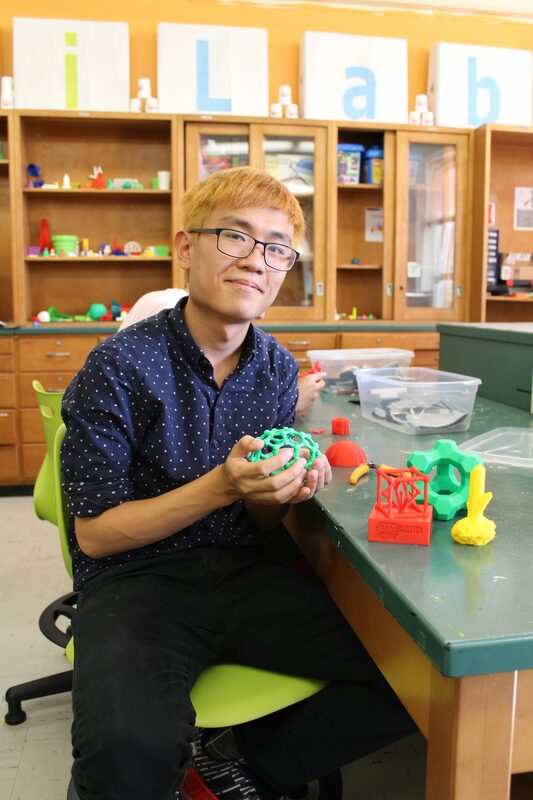 So far, he has experimented with TinkerCAD, and wants to take 3D printing more seriously by using the software and technology available at the Innovation Lab. 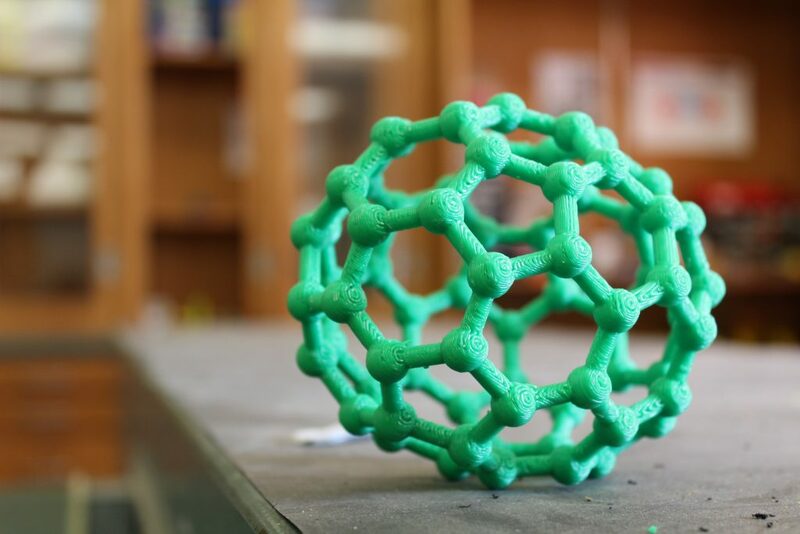 For 2017’s National Chemistry Week, Jackie has printed a “Buckyball” model, the structure for bronze, as well as a model of a crystal. The Buckyball is about 70 carbon atoms in a structure that is being used in research to deliver drugs in the body. The ball, rounded and hollow structure from connected, fused rings, can “hold” the drugs inside it. The other two structure models provide a better understanding through visualization and handling. Jackie finds that models are a more effective way to both teach and learn the basics of chemistry to the younger kids and students, with hopes that they want to pursue chemistry in the future from having earlier exposure. Needle a fresh new look for Fall? by tihhuang on October 13, 2017 . 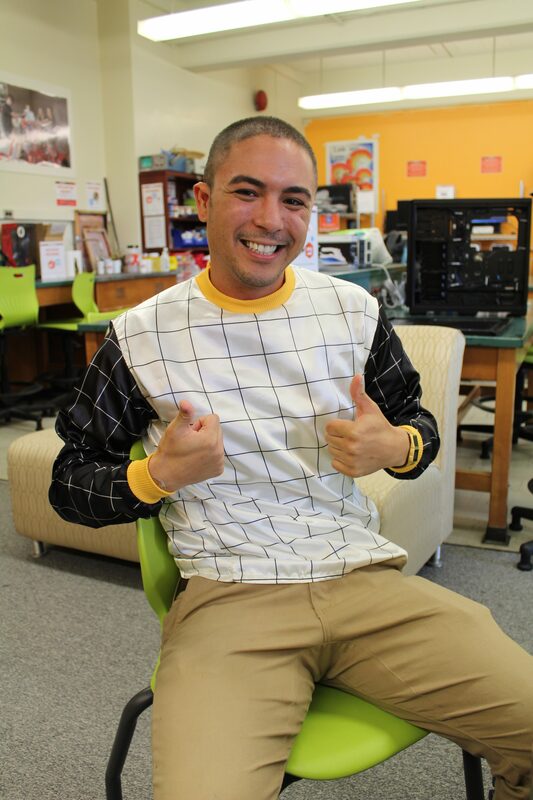 Sweater weather is in full swing for the semester, Spencer Jarrad, a 3rd-year student and transfer from San Diego City College, has been hard at work in preparation. Instead of going shopping for new clothes this season, Spencer goes shopping for fabric. 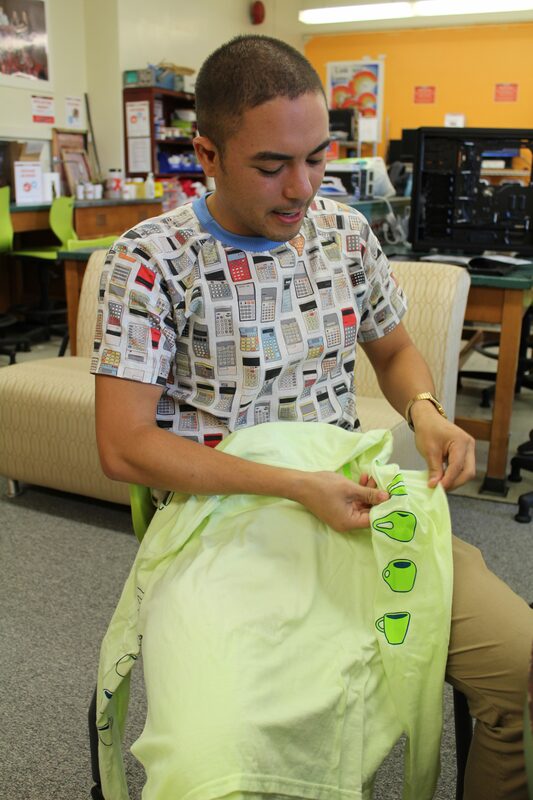 A staff member using the Innovation Lab’s sewing machine. 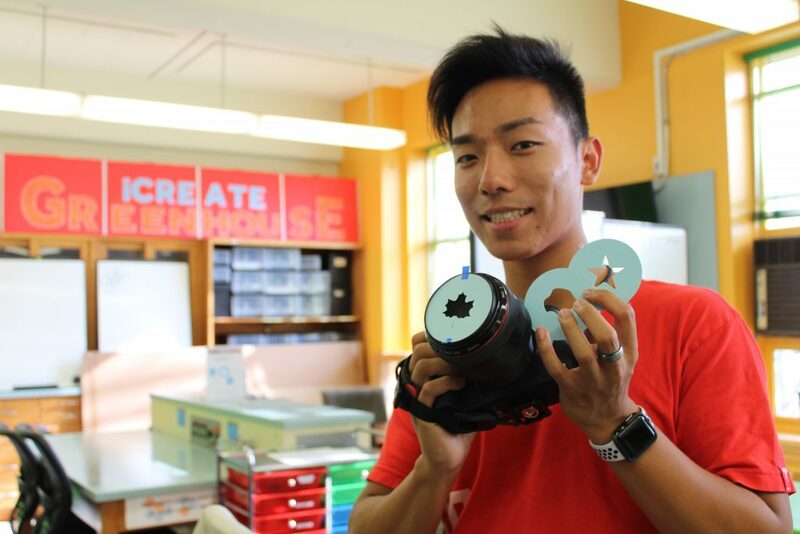 Spencer found iCREATE before he transferred to Stony Brook, by looking up makerspaces before he came, stumbling across the iCREATE Facebook page and Instagram. Upon finding the Innovation Lab here, he found that the Brother sewing machines here was of a similar model to what he used and was familiar with. Spencer with one of his geometric print shirts. After obtaining the fabric, he uses a template (originally from https://mellysews.com/ – though now he creates him own) that contains all the pieces of the shirt. He follows the template, tracing it before he cuts it out. 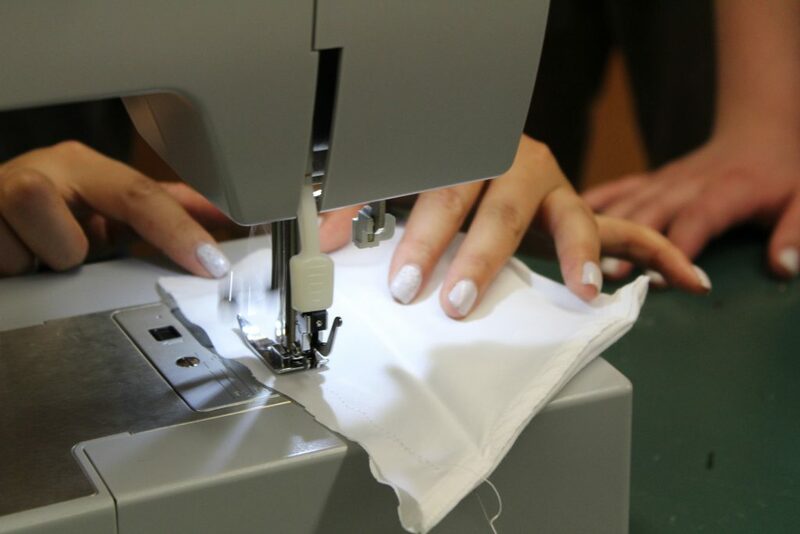 As the last step, Spencer then sews each piece together on the sewing machine. So far, Spencer has made shirts, sweaters, and shorts. 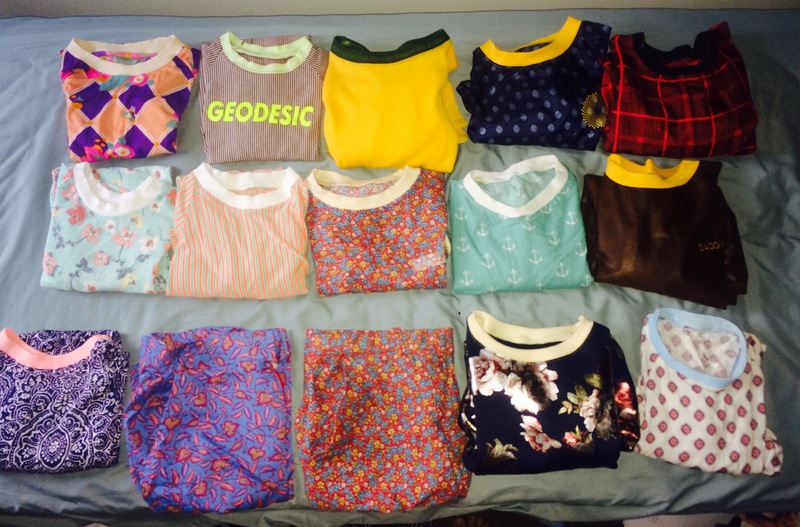 An assortment of the shirts he has made so far. This print was from a textbook – Spencer manipulated and altered it to fit his shirt design. On top of making his own clothing, he also heat transfers his own prints onto clothing, pulling designs from textbooks, and other images he likes. On one shirt, he printed a print from a textbook diagram. 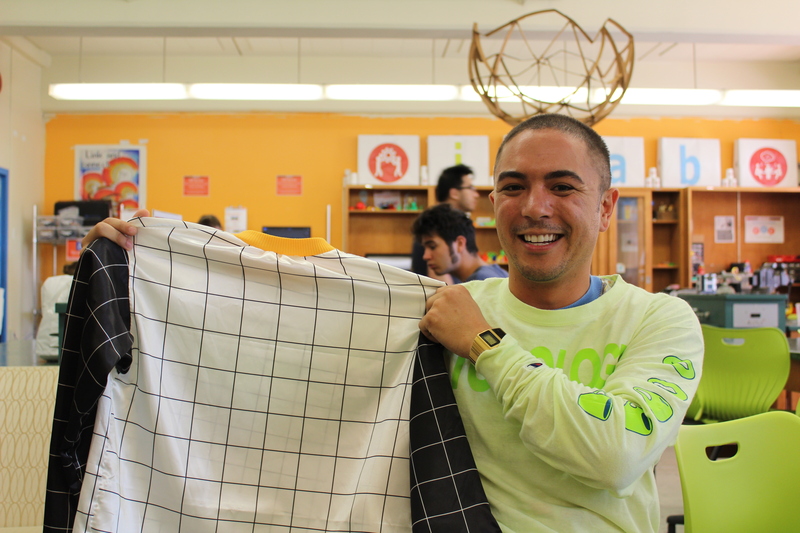 On another, he got a custom print (through spoonflower.com) on a piece of fabric to get calculator on it. by tihhuang on June 30, 2017 . Daniella Chernoff, a volunteer and a rising senior in Fall 2017 at Hofstra University, has been volunteering for iCREATE since 2015. 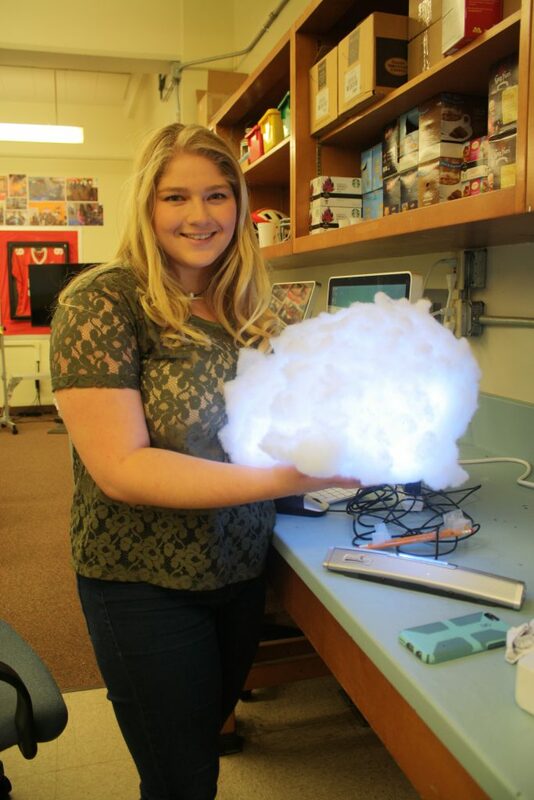 She was a student staff member who worked on the Augmented Reality (AR) sandbox that was built for the Earth and Space Sciences department last Spring 2016. Her latest iCREATE project is being added to the Greenhouse and is called the “Sound Cloud” – for its literal definition, and not the online audio distribution platform. 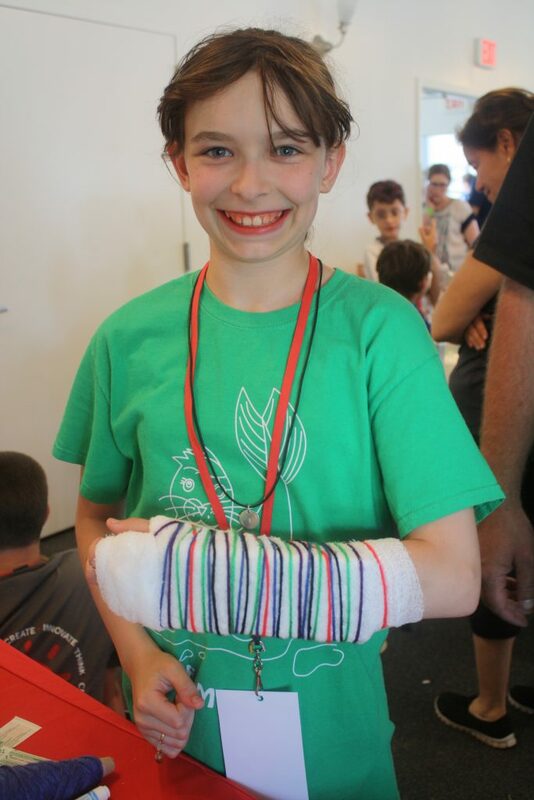 Daniella heard about iCREATE through a friend who was working for iCREATE at the time – Ellie Evans, who created and assembled the 3D printed prosthetic hand in the Summer of 2015. 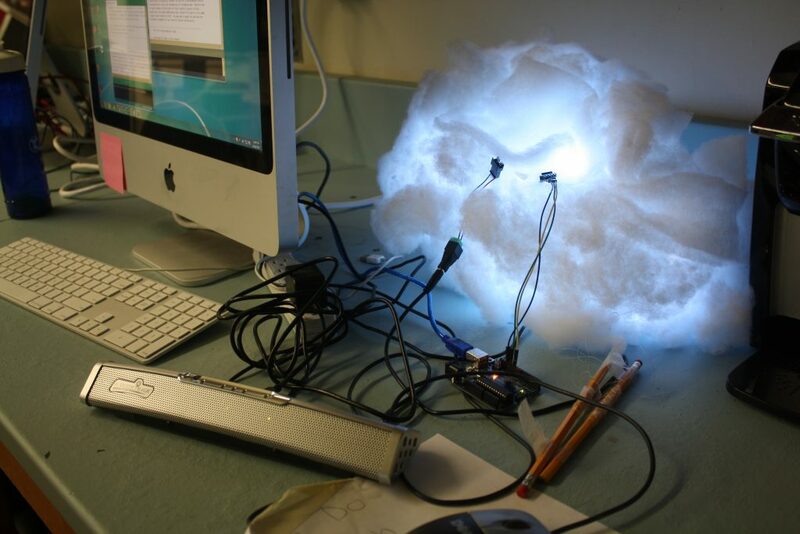 The cloud runs off of an Arduino, a microphone, and some LED’s that are all connected to a running program on the computer. It responds to sound in terms of volume and flickers, changing to the sound environment it is in. As the volume increases, the colors change from blue to green and purple in response. 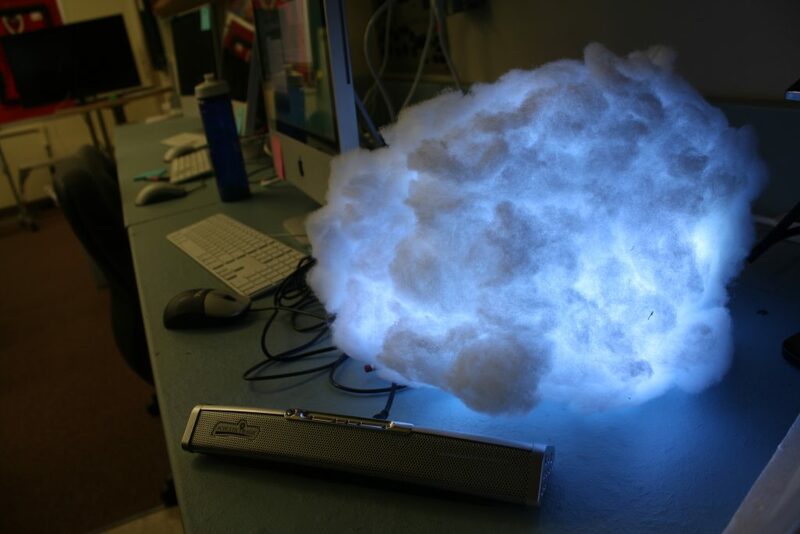 The LED light floods the cloud’s interior and creates a soft overall effect that reflects the mood of the room. 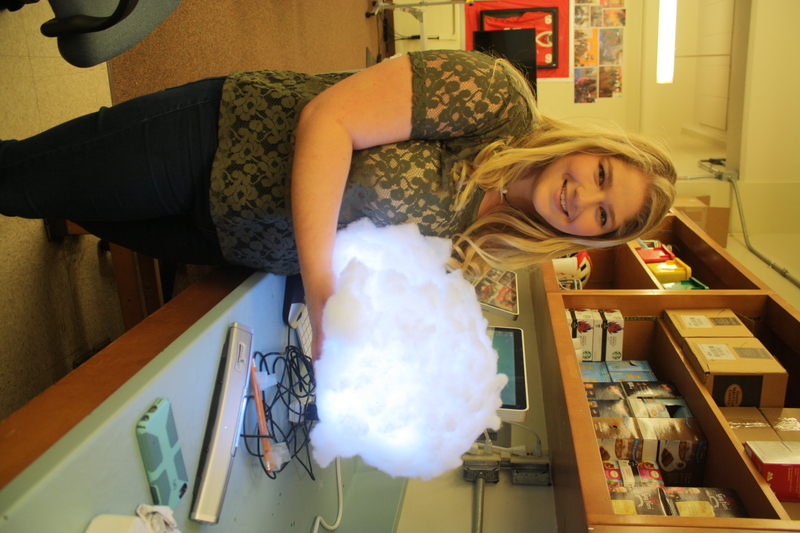 A Geology major, Daniella worked on both of these projects with no prior knowledge or understanding of coding, wiring, or Arduinos. She pulled together open-source software codes and used some of the knowledge she gained from working on the AR sandbox. Creating the actual cloud structure was simple. She used simple household supplies that were readily around her. She used a clean water gallon container to store the “parts” with the wires, LED’s and Arduino. She cut it in such a way that there would be an “easy-open flap” to access the interior. The rest of the cloud exterior is polyester fill/fluff. Her original idea was to hang it using fishing wire, and she had a mechanism prepared that used two wooden pencils to hold it in place. by tihhuang on June 26, 2017 . Audio Visual (AV) Services teams up with iCREATE again through John Berwick, a staff member from their Frey Hall Service Counter location. 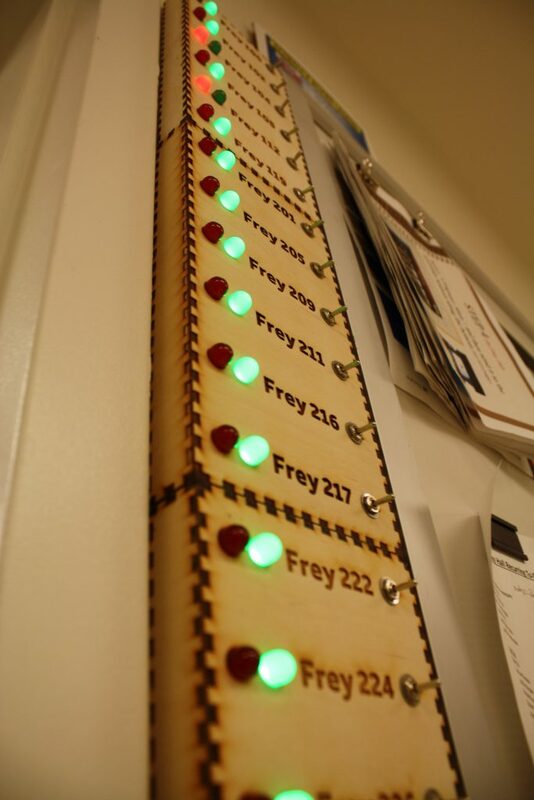 John started on this project in May 2017 while following up on AV’s other previous projects with iCREATE – namely, the one that custom 3D-printed stands for their charging stations that can be found around Frey Hall. 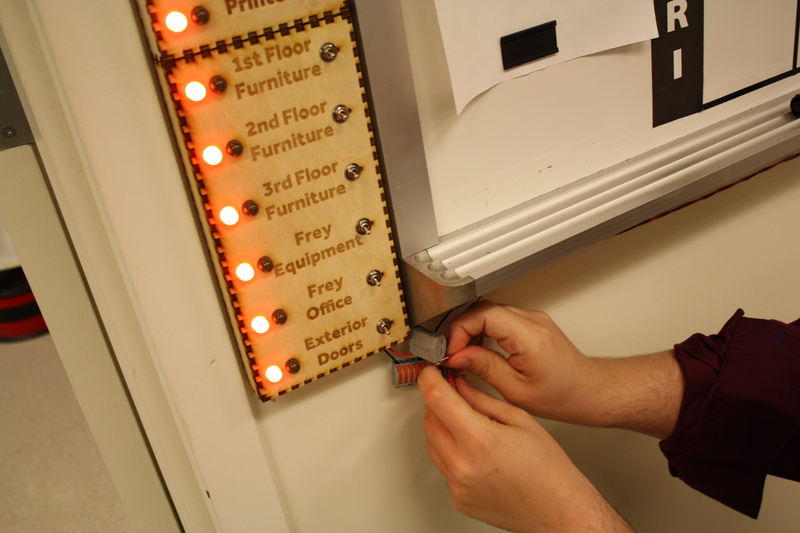 It was then that he heard about iCREATE’s new laser cutter on facility. He worked on creating a box with lights on it. 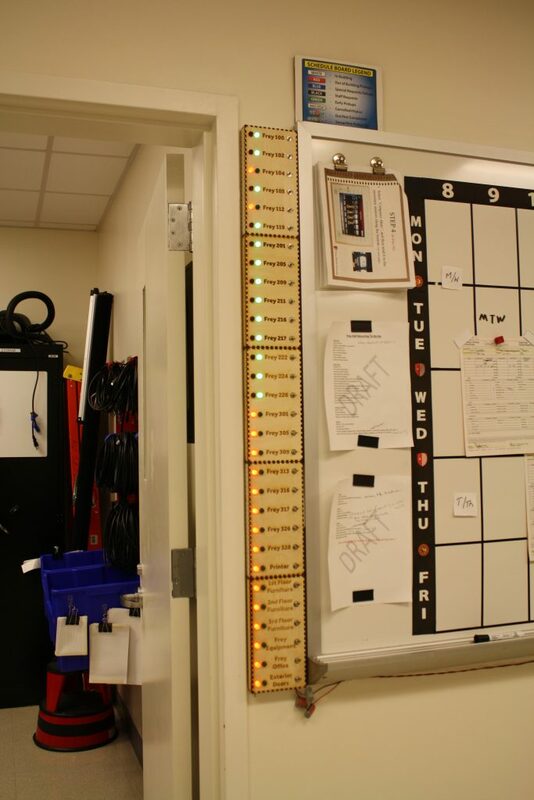 The goal was that it would be used to switch from red to green when the rooms were finished being checked. This made it clear what which rooms still had to be done. 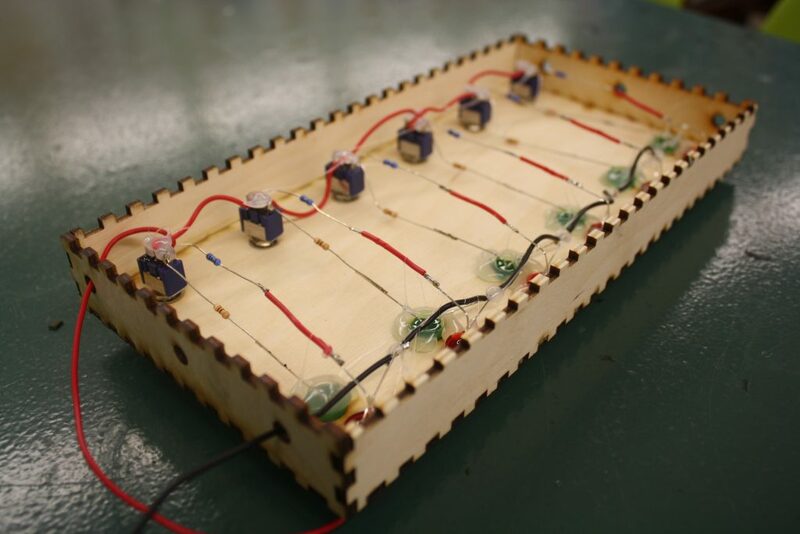 After a couple of weeks in the Innovation Lab, John was able to fashion a wooden box with lights and switches, connected to a power source (battery). iCREATE was able to supply the balsa wood, which our staff member Ahsanul Torza helped to cut into the box template using the laser cutter. 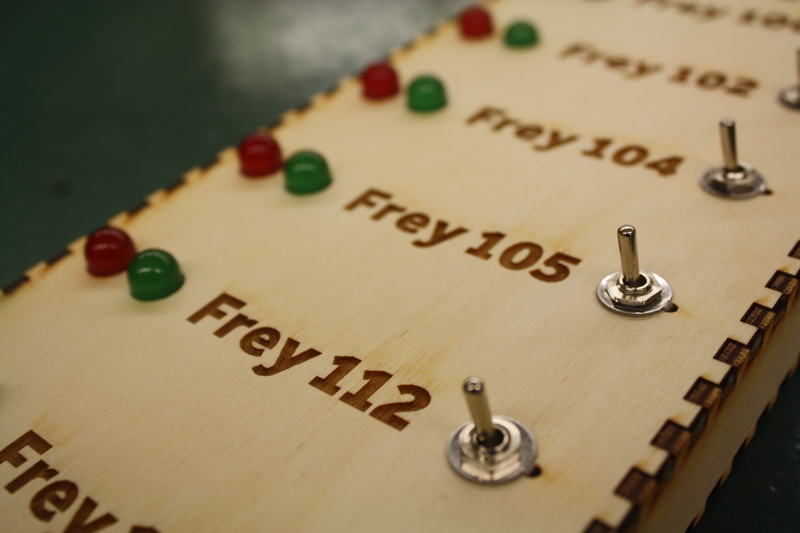 The box template was found through a website that took dimensions and created a laser cutter compatible file. John added on the text, and specified the placement and sizes of the holes for the lights and switches. 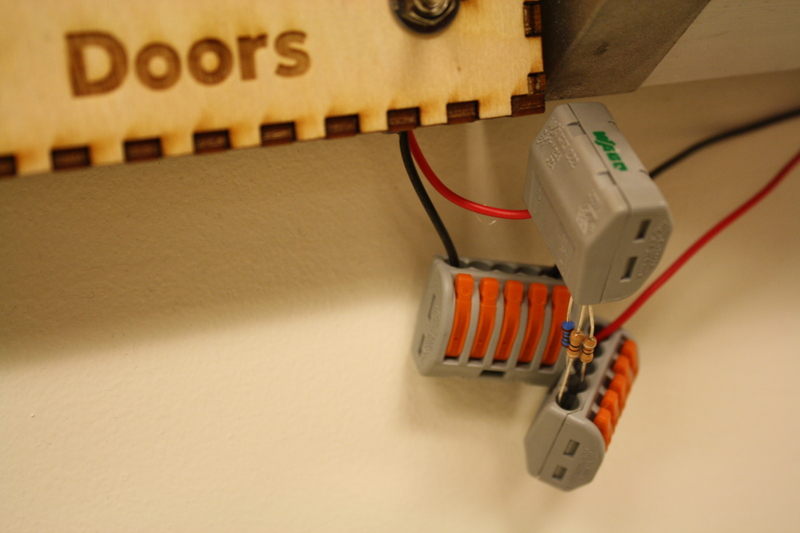 The soldered and assembled lights, wires, and resistors were then hot glued to the back of the wood, and enclosed in the rest of the wooden box. 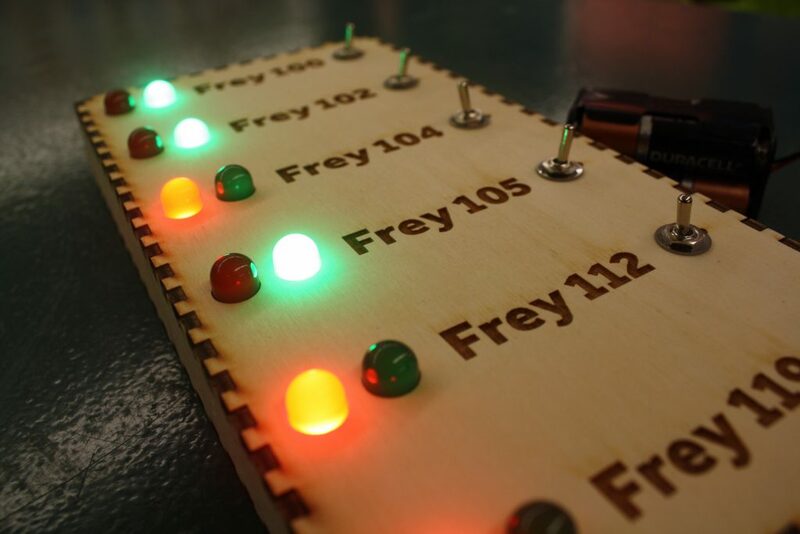 John found these supplies through Adafruit, leading the project to cost a total amount of $50-60, relatively inexpensive to create. For when it’s being used, John soldered a USB male cable to an iPad charger to connect it to power, which provides 5V. 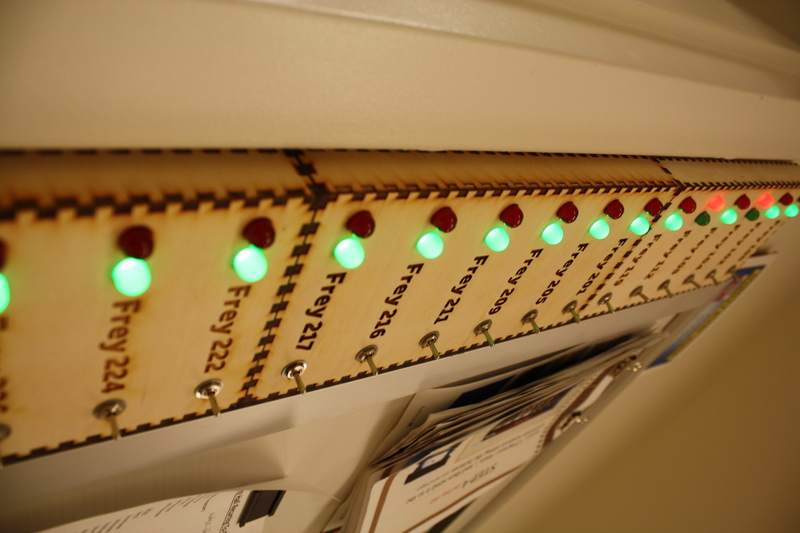 He intends to mount it in the Frey Hall Service Counter office at the back of the office where the box is designed to fit exactly the width between the whiteboard and the door. This way, it would be easy to see at a quick glance. 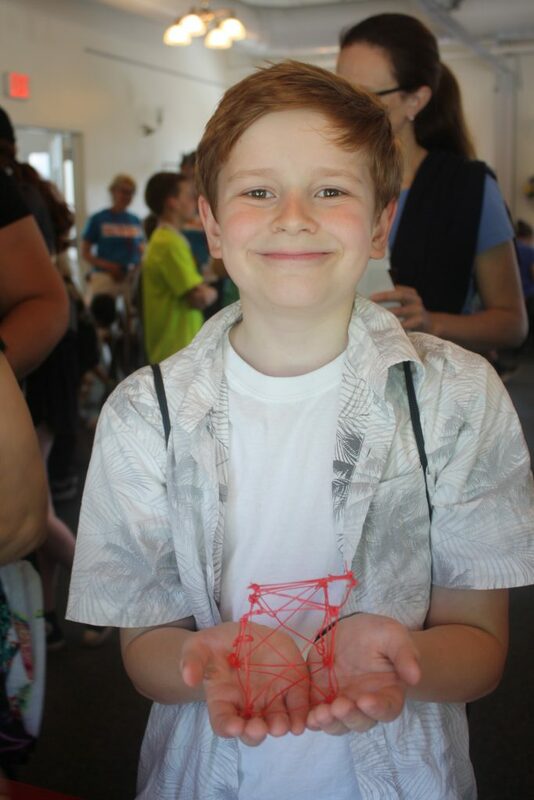 John holding up his creation at the Innovation Lab. The boxes mounted up in use in the Frey location. Modifications were added later to adjust the brightness, through these that John are holding. by tihhuang on June 21, 2017 . The Eastern Long Island Mini Maker Faire took place on Saturday, June 10, 2017 at the Port Jefferson Maritime Explorium. 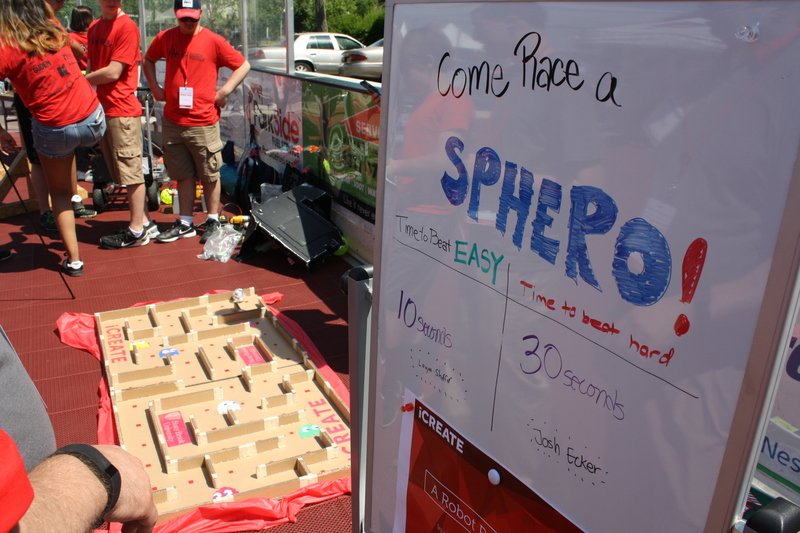 For the third year in a row, SBU iCREATE (previously known as the SBU Innovation Lab) attended the fair featured as one of the makers, and tabled with several different family-friendly, interactive activities including 3D Doodler pens, a PacMan robot maze, DIY arm braces, and 3D puzzles made of cardboard and balsa wood. As described by their website, the Maker Faire is “a gathering of fascinating, curious people who enjoy learning and who love sharing what they can do.” The makers could be anyone, ranging from engineers to artists, and is a family-friendly showcase of the interesting things people do in the spirit of innovation, creativity, resourcefulness, and invention. The impact of attending and tabling at this event reached both iCREATE staff members who attended, and attendees of all ages who stopped by our stations. Several of the stationed activities were an instant hit, with lines and crowds throughout the entire duration of the event. They were evenly split, designed with two goals in mind: to engage people in technology, and to encourage thinking “out-of-the-box” with those who did engage. 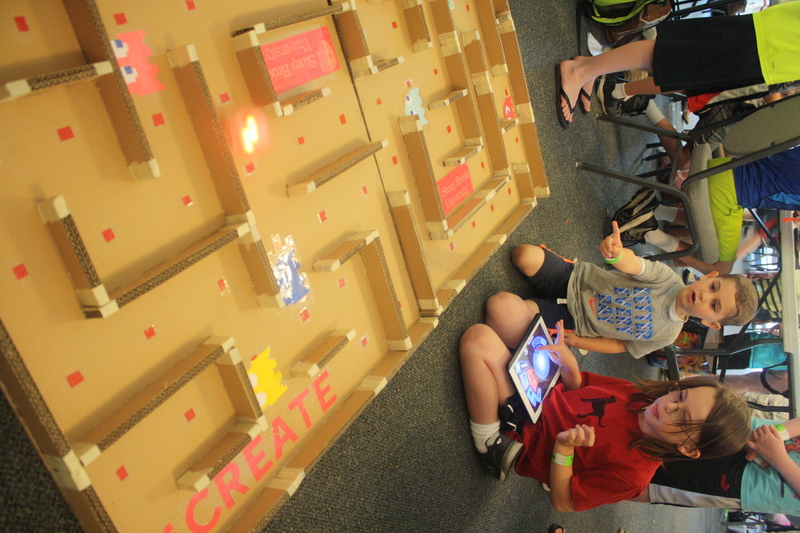 The PacMan Robot Race, Google cardboards (VR), and 3D Doodler pens all use technology to capture the visitor’s attention with the way they work. Not all of these new technologies are readily available to the average person or visitor. By exposing them to this new perspective, they are thinking in new ways. It inspires them to experiment and be creative by testing it out. The others, being the arm braces, 3-D puzzles, and Vision Trainer showcase, are bits to takeaway as “food for thought” after the demonstration/interaction or explanation. It encourages the visitor to think creatively and not in a way he/she typically would in a normal environment. It allows them to create something new and original through innovation. 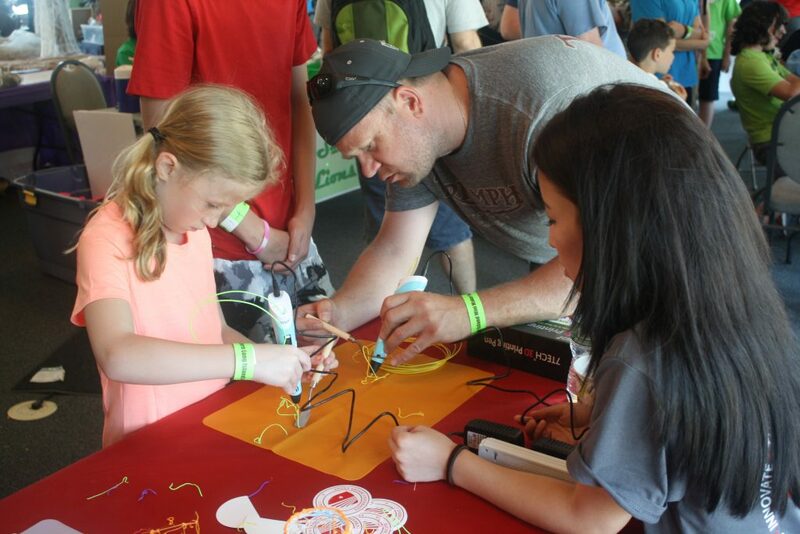 One of the more popular stations, the 3D Doodler pen station could be summarized as frustration – but in the best way. Learning how to use the pen comes with a bit of a steeper learning curve. It’s not the easiest skill to pick up, but using it is intuitive. With some practice on control of the pen and the filament, more complex designs and patterns can be created. For example, some creations iCREATE student staff have made include a tricycle, a colored cup, a tree, and a figure of a small person surfing on a little board. Of those who visited the station, it was a familiar-yet-unfamiliar item that most have at least heard of, or seen somewhere on the internet. 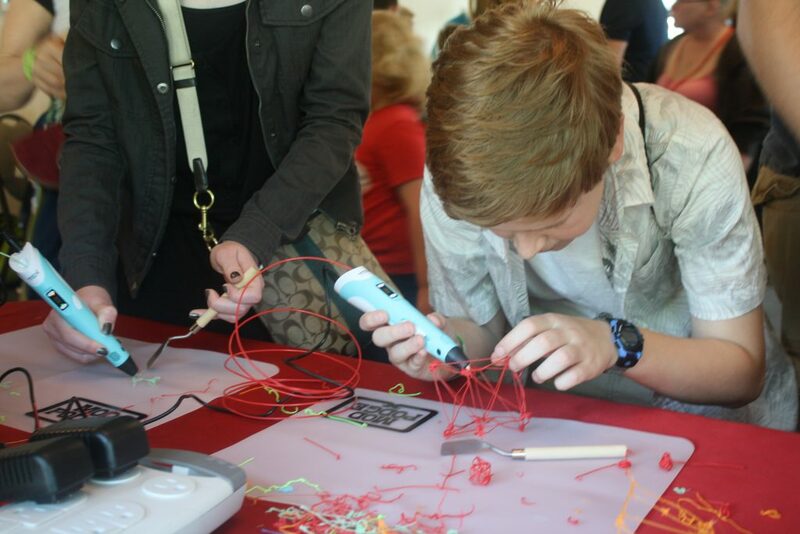 The 3D Doodler pens are an increasingly common “toy” being introduced to the public. Famous for their “draw in mid-air” pitch, the pens captivate audiences of all ages. 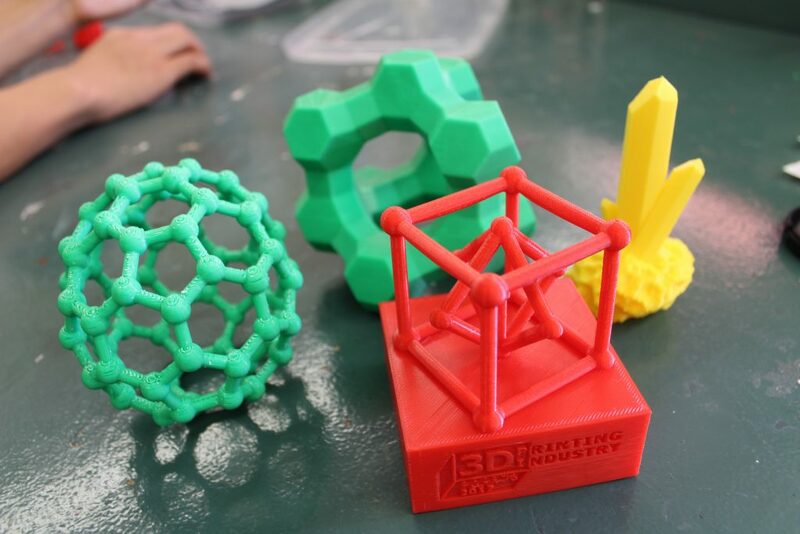 While the buzzword “3D printing” is extremely capable of drawing people, it also deters those who feel they are not tech-savvy or advanced enough to play or experiment with it. Exposing people of all ages to how simple and easy it is to use breaks a lot of barriers. 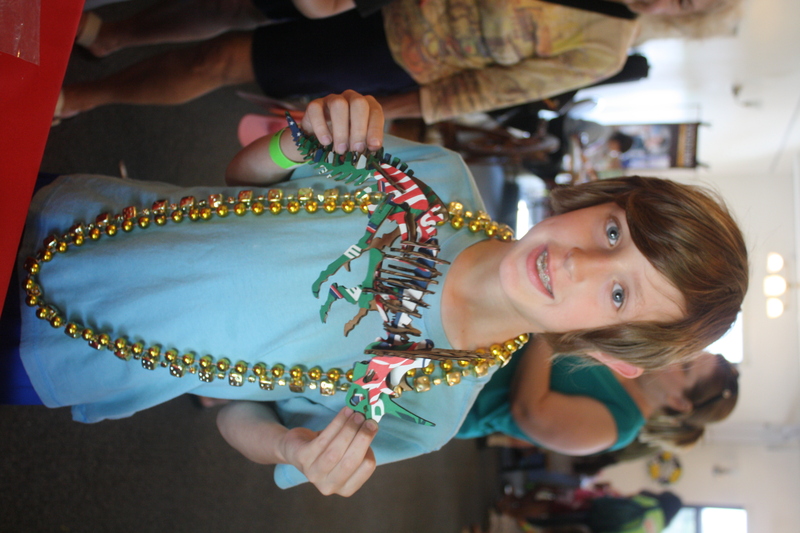 Some people picked it up immediately, making intricate designs and patterns freehand. On the other hand, some struggled with keeping the filament from sticking to itself. They were all so intrigued by the possibilities of what they could create with the pen, that our staff were kept busy the entire event. 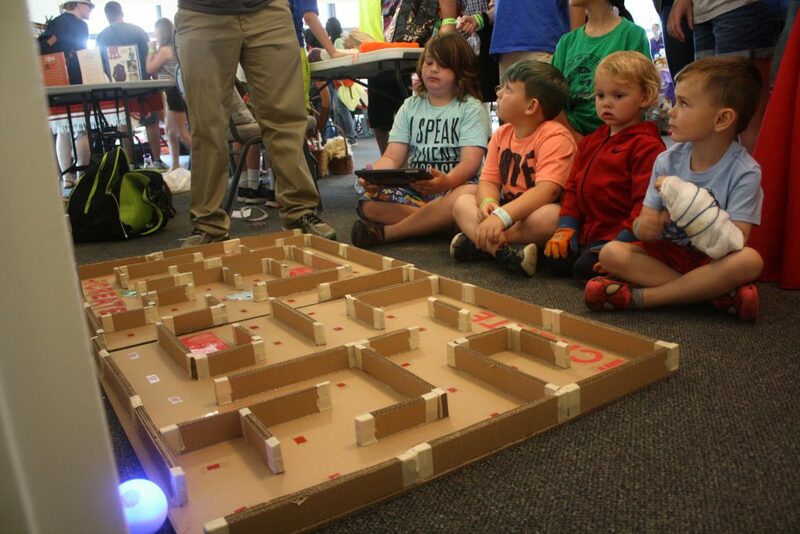 One station, the PacMan robot maze was a crowd favorite among both children and their parents. Children and parents alike waited in line, waiting for a chance to beat the high score and to get their name on the board. Visitors raced each other by recording the amount of time it takes for each person to go through it. The difficulty comes in where it is slightly hard to control in terms of direction and speed. The Sphero is a fun and interactive, and introduces any beginner or person of any level to robotics in a simple, hands-on way. We had a whiteboard present to get peoples’ names, ages, and times, and it adds a competitive edge to it, because everyone wants to get the fastest time. By the end of their turn and the wait, parents had many questions. 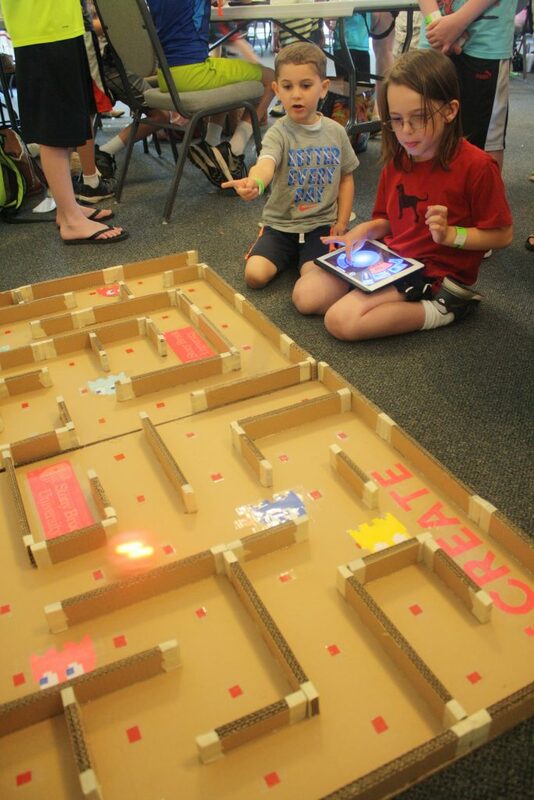 Staff members received constant questions on how the robots worked, how they moved the way they did, and even how much the Spheros (robots used) were and where they could find one for their kid(s). “I know the interaction that Rohan had was positive in teaching all ages on how the robotic movement worked inside,” David said, “It gave them a better idea (especially with the clear one) on how the internal mechanisms allows for the ball to move in different directions. 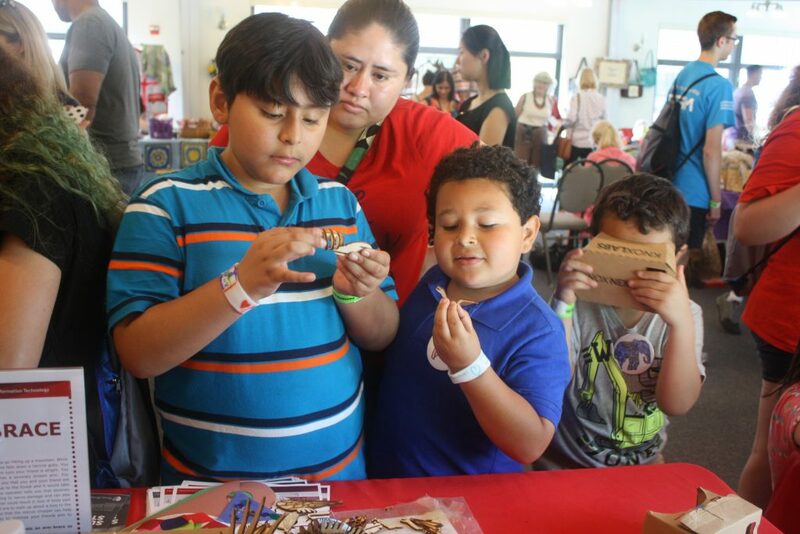 The excitement doesn’t stop at just the 3D Doodler pens and Sphero robots; the other stations such as the 3D puzzles and DIY arm braces piqued a lot of passerbys’ interests. The 3D puzzles were prepared by one of our staff members, Ahsanul Torza, with iCREATE’s new laser cutter. This tool has not yet been opened to members of the facility, because research on safety regarding what it can handle and create is underway, but simple projects such as cutting balsa wood has been popular. It was a showcase what iCREATE’s facilities are capable of, and also to engage people in finishing the puzzle. 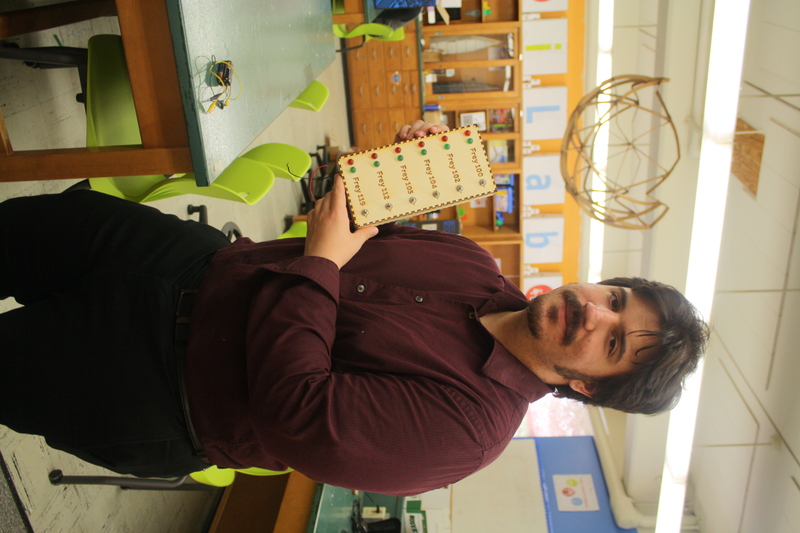 The puzzle was created by laser cutting the template out of the wood, and punching out the pieces. 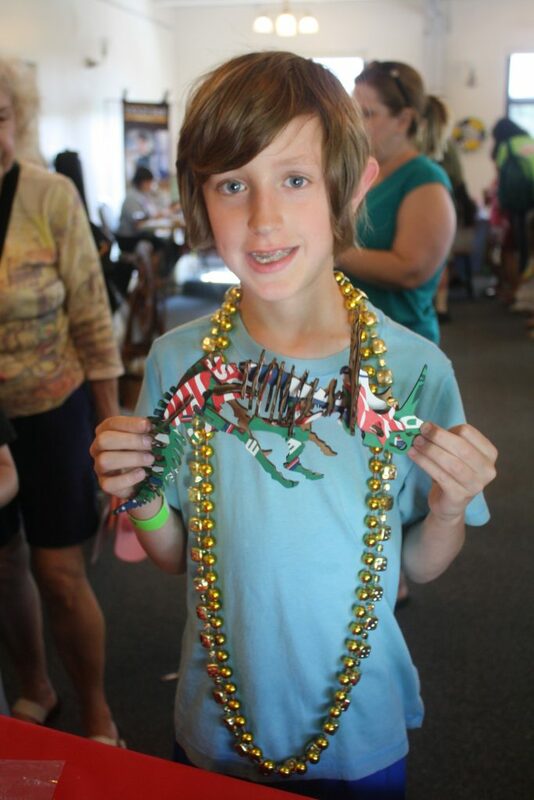 Each piece was a different component of the object. The pieces were then assembled to make a 3D object, as opposed to the average 2D jigsaw puzzle. 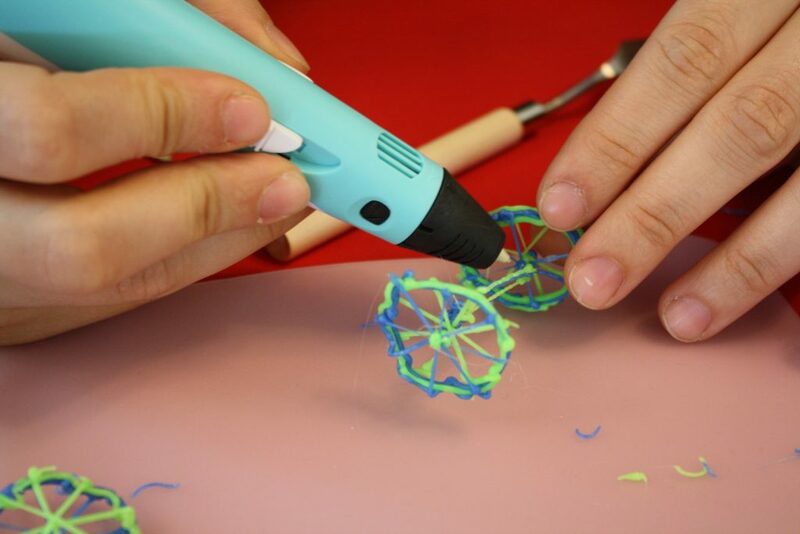 Alike the 3D Doodler pens, some take to it immediately, while it takes some longer to adjust due to the added dimension and level of difficulty from the average puzzle. 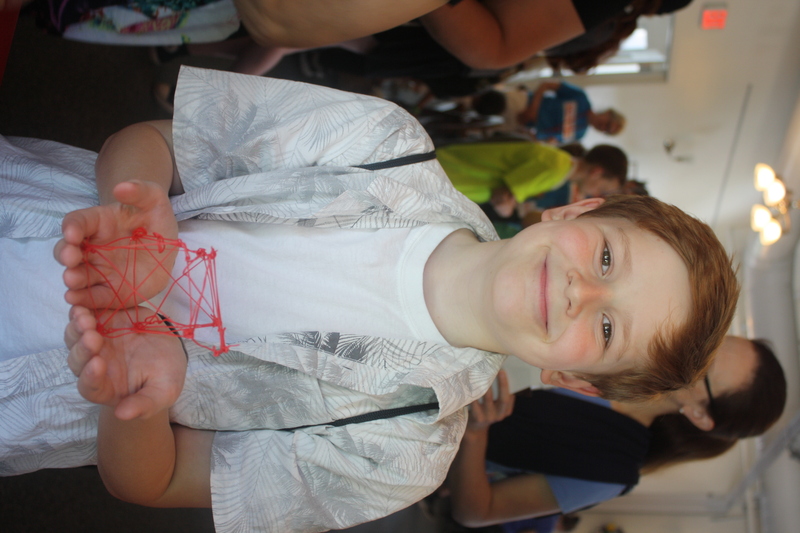 Children had a number of supplies to work with, including gauze, cardboard pieces, string, and band-aids that could be used creatively to help your friend. 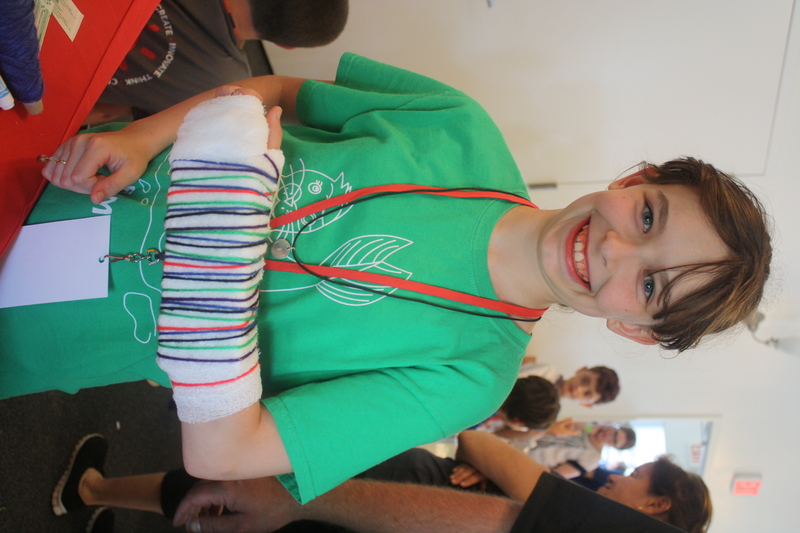 Thosen who stopped by would have to “think on the spot” with those supplies and create an arm brace of their own. It was unique because it is similar and accurate to how a real-life situation could be when one need to innovate and improvise on the spot. 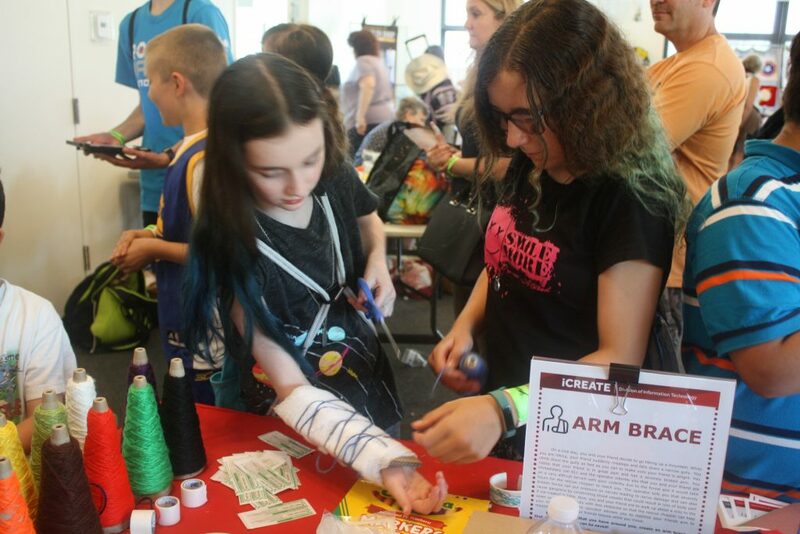 “By the end of the event, some kids were asking each other and some of us if we would sign their casts,” said Sera Nakisli, another student staff member. 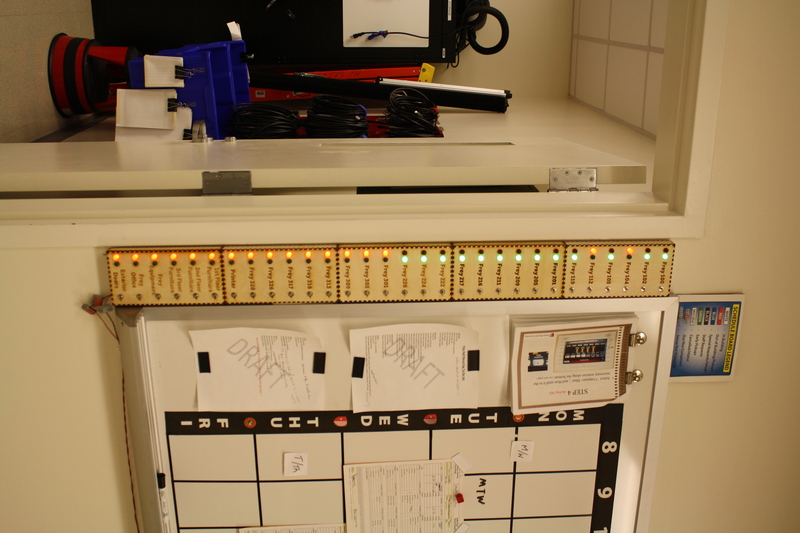 One station was the Vision Trainer project. It was a showcase: though originally planned to be a demonstration, it was not possible to fix it or get it to work. This was due to the incompatibility of motor parts from the limited budget and availability of necessary parts to make it run correctly. Unfortunately, its current configuration causes the motor to burn out quickly and does not allow it run the way it should. As such, this was used as an example of how innovative ideas are born, created, worked on, and also how it doesn’t always work out. Find out about new Innovations!